There you are waiting and wondering what’s next for your life. You’ve always been a list maker, someone who’s lived in the future, planning and living for the next box to check off your list of life achievements. You couldn’t wait to check the Mrs. box and announce to the world that you’ve found your true love. Check. You couldn’t wait to expand your family and had been planning your pregnancy announcement years before it came to fruition. Check. With those dreams achieved and conquered, you’re wondering what’s next for your life. In order for you to feel alive and excited, you plan your life one goal at a time. Always striving and reaching for that next milestone, you’re not fulfilled unless you’re plotting and planning your next step. Looking at your imaginary list of life achievements, you realize that many of your dreams have already come true. But as each dream is reached, you hunger and thirst for more in your soul. And now you’re at a crossroads, eager to move towards some new goal and reach that next phase. Yet for once, you have no idea what’s next for you. It’s terrifying not to live plotting your next big move. In fact, you find yourself paralyzed and more than a little fearful of what the future has in store for you. Yet friend, this time in the waiting room of life can be precious. As you’re on the brink of the unknown, God can mold you and fashion your character in His image. It’s in the season of wondering that God can grow you in faith as you learn to seek Him for direction and guidance. It’s in this this holding pattern where your relationship with Him can bloom, as you rest in His promise to guide and direct your steps. It’s in the unknown where character is refined, and that you learn to lean on Him for your next breath. While this season of wondering seems like you’re standing still and that time is ticking away, instead of plotting and planning, you can take action with these simple ways. Rid yourself of the noise of this world, and block out the sounds of the masses telling you where you should go and how you should be. Trim the excess from your life so you can hear God and truly know where He is leading you. Sometimes the noise of social media and the trappings of this world can overshadow His voice and lead to discontentment. Simplify to make room for more of Him and less of you. Instead of planning your own course, hit your knees and seek God’s face. Dive into His Word and pursue Him instead of your next dream or milestone. Take this opportunity to focus your heart on Him alone, diving deeper into His Word than ever before. Have the courage to overhaul your spiritual life before taking your next step. Yet if you find yourself struggling in Bible study and prayer, boldly take the steps to grow closer to God with the FREE e-Course, Make Over Your Family Bible Study. This resource will guide you towards practical and easy ways to grow in faith (Bible study ideas for the whole family, too!). Simply register below to reserve your virtual seat and experience creative ways to explore God’s Word. Trust God’s promise to guide you on this great journey through life and pray with purpose as you seek His wisdom. While it may seem that life is one big mountain to climb and milestone to conquer, may you find that a deeper passion and love for the Lord is your ultimate reward. Friend, He is your prize. Time waiting for the next phase of life can be consuming and it’s easy to become blind to the needs of others. We can easily miss the opportunity to lend a helping hand to someone in need when we’re focused on our own struggles. Dare yourself to look outside your tunnel vision and to open your eyes to the aching world around you. May God give you the vision of how you can help a hurting heart during this season. Get outside yourself and love your family like tomorrow is your last day on earth. Find a ministry or a tangible way to be the hands and feet of Jesus. Encourage others around you with thoughtfulness and acts of service. As you wait, trust that God will reveal His path to you at the appointed time. While it’s tempting to wish away this season, passionately pursue a God who loves you and longs to know you. His peace can eclipse the longing and yearning with joy and rest in His holy presence. There IS joy in the blind, child-like faith that leads to a life fully humbled and surrendered before the King! 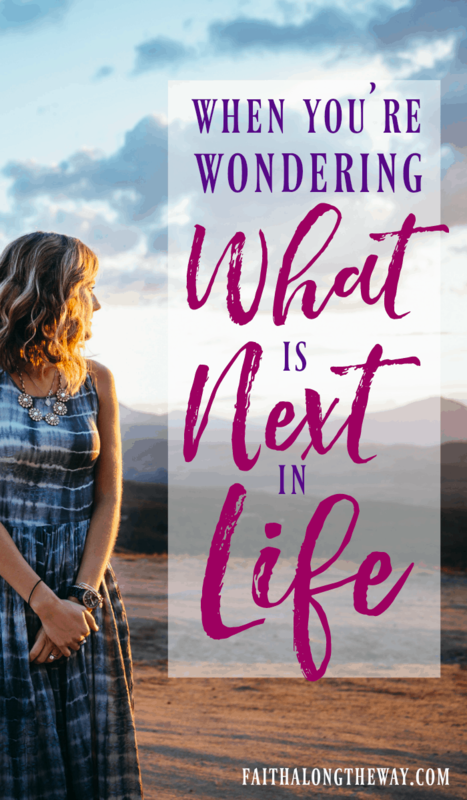 Are you in season of wondering what’s next in life? How could these simple steps change your vision for your life? Waiting can be so hard…but it is so important to wait for God to speak. Great post! Yes it can be! I am not that patient, either! Ahh, this is me right now. Confused and stressed, as we are on week 9 on waiting to see if my husband will receive unemployment. He is qualifying for a grant-funded retraining program, which I believe is his place, but the trust and waiting is an ordeal. I’ll be praying for you! Waiting can be so hard, but freely giving our worries to the Lord frees us from the angst! This is such an uplifting post! This is a reminder I have needed so often in my life. It is so easy to get caught up in the discouragement of waiting when waiting can really be such an opportunity to grow in the Lord! Thank you! Meredith recently posted…Too Many Blessings? Thank you, Meredith. It’s so easy to be caught in this trap, and so freeing when we seek God instead of our next “thing”. I am definitely one of those people that focuses on the next thing to plan or the next big milestone (right now it’s a house). I always have to remind myself to enjoy and be content with where I am now, and focus on what truly matters: a life about God, not a pursuit of worldly things. Thanks for the extra reminder! I understand, Jessica! For us, it’s the next house, yet there’s so many factors that are involved it makes my head spin. 🙂 Pray hard and stay strong! Oh Sarah Ann…. I so needed to hear and heed this message today! Thanks for this one truth in particular: “Simplify to make room for more of Him and less of you.” I’m feeling overwhelmed by the clutter and the day to day living- car repairs, pet drama, job worries etc…. but you hit the nail on the head. I love your simplify, seek and serve approach. What a timely reminder…♥ Have a wonderful day! heather m. recently posted…Purrfect Timing? I am there with you, Heather, buried under the day to day. Blessings to you as you seek the Lord for guidance and direction. What a beautiful post Sarah Ann! So happy to have stumbled on your site through the Coffee For Your Heart linkup. I am going through a time like this right now where I am waiting for God to show me what step to take next. I know what he has placed on my heart but I don’t know what the road ahead has in store. These are helpful tips to keep in mind along the journey! Blessings to you! Hi Sarah Ann! I haven’t stopped by your online home in a while but I’m always excited to read your words! Waiting for the what’s next seems like it’s a constant for me but when I look back, I see what I thought was just a holding place turned out to be a whole lot more. Thanks for these words of truth today, friend! It’s always wonderful to have you Valerie! I often find myself waiting on God, and know you are not alone in this! Hugs to you as you wait, my friend! This post resonated with me today. I am definitely in the season of wondering what comes next. I finished my last book project and while it’s evident now is not the time for publication I am waiting on God to tell me what’s next. I agree that we must Simplify, Seek and Serve. I’m in the Serving phase. This for me is learning the art of speaking and teaching others in a public forum. A safe place where I can fail miserably and learn from my mistakes in a room full of grace and mercy. While I never imagined I’d teach adult women at church, God has led me to this opportunity and I can see it is a time for learning and growing. Enjoyed reading from #coffeeforyourheart link up today! Blessings! I’m in the simplify and seeking stage. While we should be always looking for opportunities to serve, I believe sometimes God wants to full us with Him first. Best wishes to you as you serve and pursue God’s next step! Hi, Sarah Ann! I’m stopping by from Grace and Truth’s linkup last week. Thanks for sharing these wise words with us! Thank you, sweet friend! Blessings to you! So wonderful – what an encouragement to be still and just get before the Lord! Very timely! Thank you! Lisa Morris recently posted…Do You Think By Your Works You Will Be Saved? Blessings to you on your journey, Lisa! 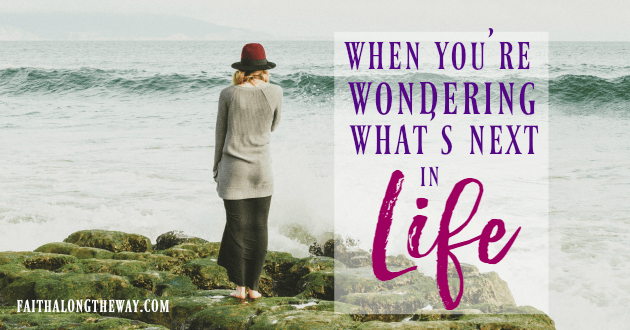 I know that feeling and wondering isn’t always an easy place to be!